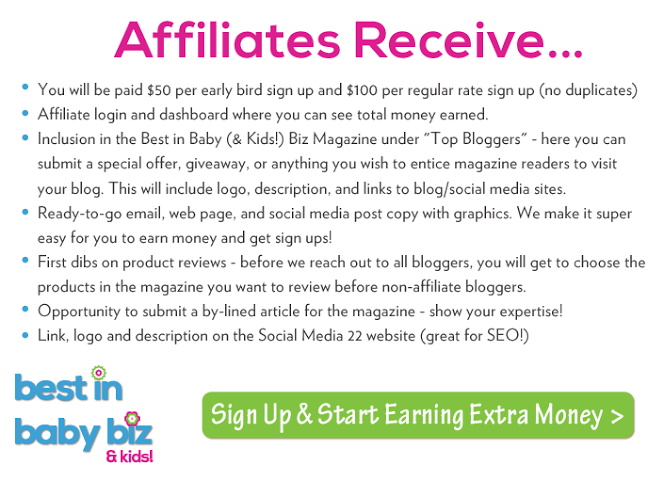 BIBB Spring Issue Affiliate Sign Up – Earn Extra Money! I am a BIG believer of paying it forward to those who have helped me. As a baby & kids brand publicist, I’m always saying how grateful I am to mommy bloggers and appreciate your time and effort. SO…we wanted to create an extra stream of income for you as a special thanks – a small token of our appreciation for being such amazing bloggers! 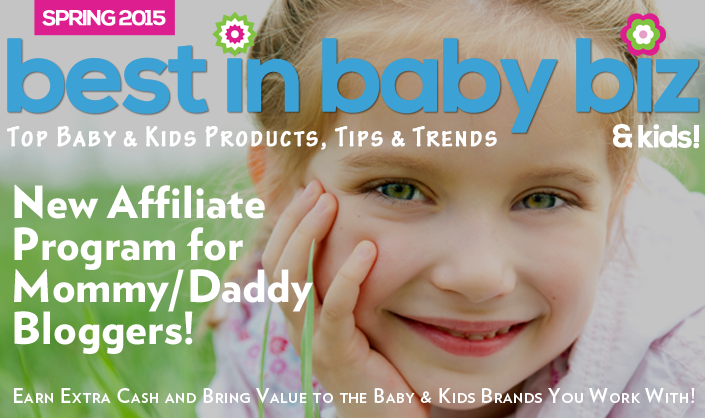 To earn extra (easy) cash and to provide value to the brands you work with, sign up to be an affiliate for the Best in Baby Biz (& Kids) Spring/Baby Shower Magazine (see below all the amazing benefits you will receive). What this means for you is each time a brand signs up from your affiliate link, you will earn $50 (early bird rate) and $100 (regular rate 2/21 – 3/15). If you sign up 25 brands you will receive an extra $1,000 bonus! And this is not just any magazine – brands get guaranteed media placements, increased website traffic, social media followers, emails to market to, sales, exposure, plus more! With our reputation and proven results (see below for more about us) along with the affordable price point, this should be easy money for you. And you deserve easy money for how hard you work! >>View our one page flyer to see what brands receive for unbeatable value. >>Review full details of what brands receive here. We have three issues per year: Spring/Baby Shower Issue, ABC Kids Expo Issue, and the Holiday Issue. As an affiliate you can earn extra money for all issues! Currently, brands can sign up for the Spring/Baby Shower issue until March 15th but the sooner you sign up the sooner you can start earning. A little about us…we have worked with over 100 baby and kids brands and have built a reputable name for ourselves in the baby and kids industry. Take a peek at a small sampling of our results. Also, take a peek at our media kit to learn more about what makes our company so special. Now that you know a little more about us, the brands you work with can now get some AMAZING exposure and results with the Best in Baby Biz (& Kids) Magazine offer. BEST PART IS, it’s so easy for you to earn extra money through our affiliate program! We provide you with ready-to-go copy and graphics to send to brands you have worked with (email, web page, and social media posts) — so it’s easy peasy for you to get signs ups and earn $50 for early bird sign ups and $100 per regular rate sign ups! Become and Affiliate today! Sign up here and you will receive an email with next steps once you sign up. Ready to earn some extra money? !